← Dog of DOOM: Paddington Again! Indi Al Jamal Bella of Zekreet was found in an abandoned fishing village in Qatar by a Greek microbial biologist and her black lab/border collie service dog from Tennessee. 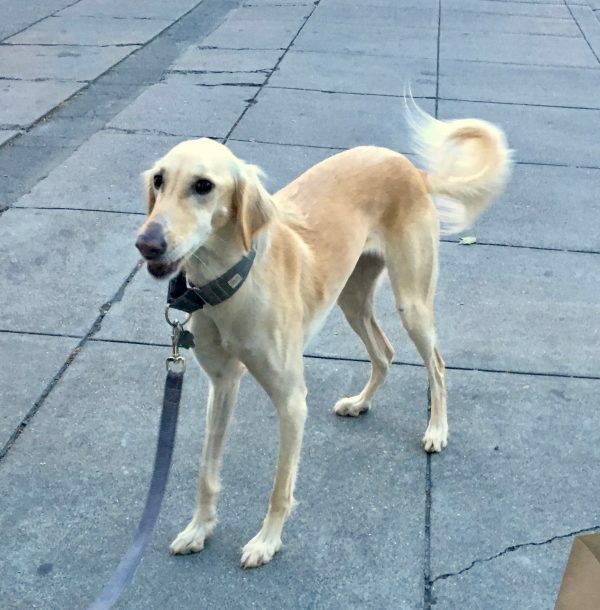 Her paws and tail had been dipped in henna, which is done to racing dogs. We’re not sure how she ended up in the abandoned fishing village. While the microbial biologist wanted to keep Indi, she travels a lot as a consultant for Cornell. She reached out to some friends, a retired Canadian nurse and her American husband, to foster her. They took her for a few months and then contacted Desert Hound Express to help find a forever home since they travel for the hottest months of the year. We found her via the dhex website. We Skyped with her so we could kind of meet her. We were in love. A few weeks later a wonderful couple flying to Boston from Qatar took Indi along with them as a flight buddy to Chicago. We also flew to Chicago and waited for Indi to come out. She was so jet lagged and excited to see all the grass. The next morning Indi flew back to the Bay Area with us. She’s the life of the party. So there you have it. 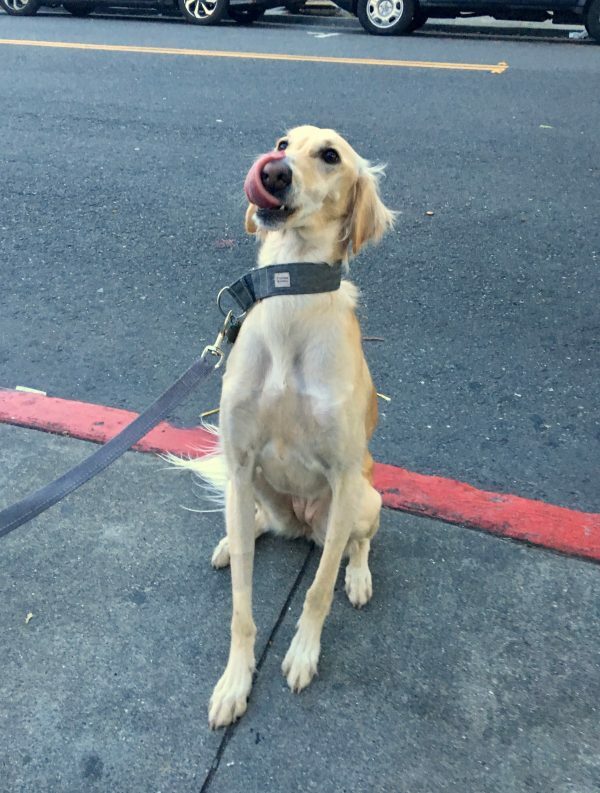 A racing saluki from Qatar ends up in San Francisco by means of a Greek microbial biologist, a Tennessee black lab/border collie, a Canadian nurse, and a small army of other people. It’d make a great movie. The body language looks a little standoffish, but she wasn’t. 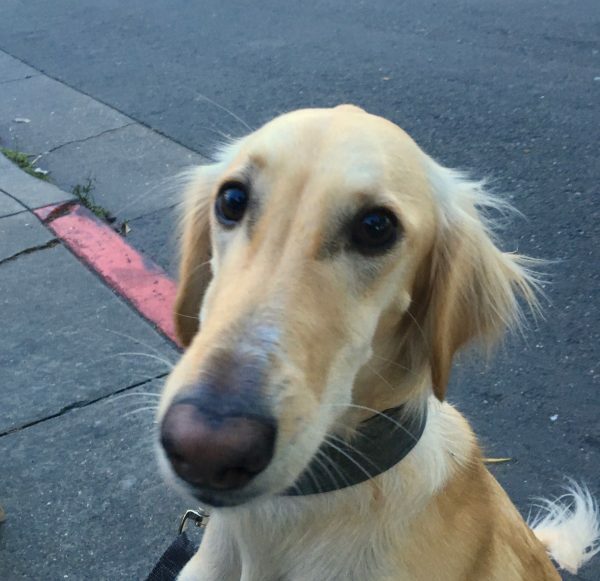 She was just concentrating on sitting and staying. A tail that doesn’t know whether to ploof or curl. 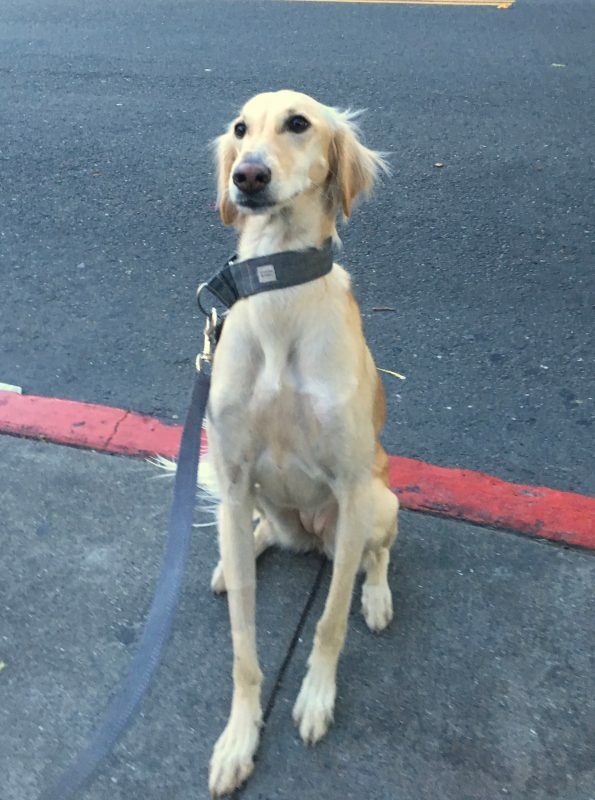 This entry was posted in Dog of the Day and tagged Berkeley, East Bay, Saluki. Bookmark the permalink.